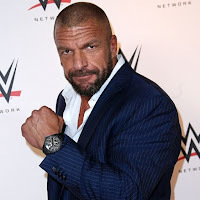 Triple H took part in a media call after NXT TakeOver: Phoenix. Hunter talked about Velveteen Dream and discussed wanting to progress younger stars at a slower pace, and how some fans are expecting too much, too soon from NXT Superstars. In regards to Dream's absence, Triple H simply put that there's not enough room to put everyone in every card, but at the same time, it's a good thing to mix it up with the talent they have. "The dude is a star, but you can only fit so many people into a card," Triple H said. "Him not being on the show—Adam Cole wasn't on the show tonight too, you can only fit so many people. It's a funny thing in our business, it's like well, 'Where was this person on the show?' If it was UFC they're not all on every card, they don't fight all the time. I think that's part of the awesome aspect of this and the variety of it, you're not seeing everybody, every single time, and you're not doing all that stuff. [Dream] had star moments tonight, to me, in just the little bit of stuff he did. He walked out there and sat in the crowd." Triple H also noted Dream's arrival to the building was supposed to be something else, but it didn't pan out for the show. "Yeah, the arrival, we actually had something else planned, but it didn't work out." Triple H continued about Velveteen Dream's short time in the wrestling business, at only 23, his ability is off the charts. The same goes for Bianca Belair, who came to the WWE Performance Center just under three years ago. In her first crack at the title, Belair came up short against NXT Women's Champion Shayna Baszler and Triple H called out fans who were being impatient about bringing talent up through the ranks. "It's all little steps of being a star, right?" Triple H said. "The one thing about Velveteen Dream—I think that everybody fails to realize with him—is he's been in the business for a minute. How far he is and how big of a star, and how he gets this, it's awesome. I think you want to make sure he takes the right steps to get there in the right manner, so that it all works in the best way possible and doesn't become too much, too soon, in the wrong way where you put him in a position where he might not be ready for it, or could fail. "I don't see that in front of him, but it's always things you keep in mind. You can look around the locker room—as I said earlier with Bianca Belair. Walking into the door two-and-half years ago to doing what she did tonight. There's people out there who are going, 'How could she lose tonight? This is horrible for her.' It's step one, the future couldn't be brighter for her, same with him, but the future couldn't be brighter. It's just the world today is so impatient, they just want it right now. If you're not champion in your first match, people are like "Aw! How could they do that!" You know what I mean? It's just a crazy, unrealistic expectation, but in some way that's a good thing and we'll take people along for the ride and get them where we need to get them."